Okay, so this is basically healthified pasta salad. I am a BIG fan of couscous, quinoa, and other type grainy things. So this weekend I made my lunch for the entire week by making one big bowl of couscous salad. It’s SO simple, and since it’s served cold it requires no prep work each day when lunch rolls around. Here is my “recipe,” but please know you can pretty much do whatever you like…that is what makes it so great! Cook your couscous (or quinoa) and let it cool. Meanwhile, chop up all your veggies. Once your couscous is cool, mix it with all your veggies and your feta. 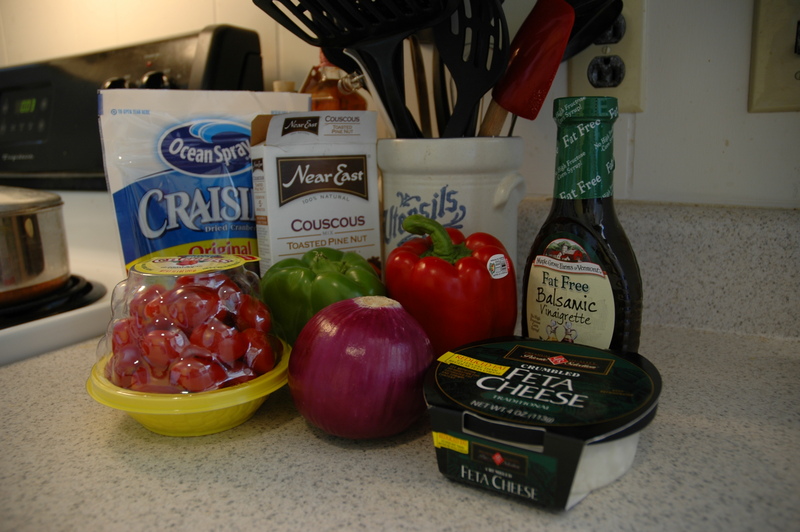 Then drizzle balsamic vinaigrette and mix it in – I used about 1/3 of the bottle. This tastes best once it sits in the fridge for a while. You may need to add a little more dressing throughout the week if it starts getting dried out. Also, be ready for some serious red onion flavor. You might see craisins up there in my photo. I love craisins, but as I put this together I realized how savory it was, and that I might not love to have craisins in it. But again, your call – it will ALL taste good in this little concoction! *I had no idea that this is how you spell “vinaigrette” until my spell check caught it. Did you?